“I wish that fellow students would not think it’s weird that the classmate sitting next to them has a guide dog,” says Michelle Woolfrey. Michelle Woolfrey may navigate the world through the eyes of a guide dog, but she wants to teach others to see more than that when they meet her. “I don’t bite. I’m pretty friendly. I like Netflix as much as you do. I’m a normal, average university student. I just happen to be blind,” she says. Besides being a student at Ryerson University, Ms. Woolfrey is also an experienced motivational speaker on the topics of accessibility, disability and inclusion, having presented at Ryerson, the University of Waterloo, York University and other institutions under the banner of her business, Blind Girl Inc. 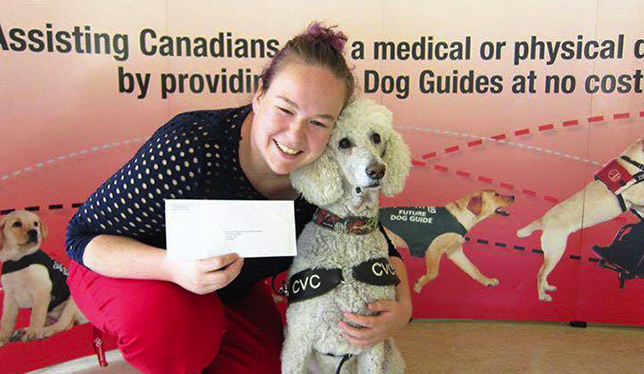 In May, she helped direct attendees at the University of Guelph’s Designing for Diverse Abilities conference towards understanding how service animals are used in the classroom. Ryerson student and motivational speaker Michelle Woolfrey with guide dog Thomson. Ms. Woolfrey, who begins her talks by relating some of her own journey into disability. At 16, a rare brain condition crushed the optic centre in her brain and left her blind (though she has a bit of light and shadow perception). Ms. Woolfrey eventually transferred to W. Ross Macdonald School for blind and deafblind students in Brantford, Ontario, after being bullied. While there, she recognized the benefits of a guide dog by watching a friend work with one. “She introduced me to what that looks like and how much independence her guide dog gave her. I fell in love,” she recalls. Ms. Woolfrey also helps those who attend her talks to understand appropriate behaviours around a service animal. For instance, she says some people don’t know to refrain from patting or even talking to a dog in service. “It’s important not to interact with a team [the service dog and its handler] to distract the animal in any way,” she says. But that doesn’t mean you can never offer help. “If you see the team struggling or you think that you can lend a hand, you respectfully ask if you can give assistance,” she says. She adds that leaving the service animal alone also does not mean ignoring the owner. “I wish that fellow students would not think it’s weird that the classmate sitting next to them has a guide dog and not know how to talk to me,” she says. Ms. Woolfrey adds that classmates tend to respond to her in one of two ways: they’re overly friendly or indifferent. If they’re friendly, they may try to pat her dog and think it’s rude when she asks them not to. These reactions often come out of misinformation around disability and service animals, which Ms. Woolfrey says she tries to correct during her workshops. To that end, her talks address legal rights and legislation around service animals, what a school is allowed to ask for in terms of paperwork and disability identification, and what to expect of a service animal in the classroom. She also reviews the differences between service animals, therapy animals and emotional support animals – while people recognize guide dogs, they often don’t realize animals are also used for conditions such as diabetes, autism, narcolepsy and post-traumatic stress disorder.